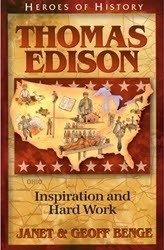 This review of Thomas Edison: Inspiration and Hard Work is our fifth review for YWAM Publishing. It is always a blessing and an honor when vendors come back to the crew, especially multiple times, because it means that we are doing a great job with sharing their products. However, the blessing is not one-sided. 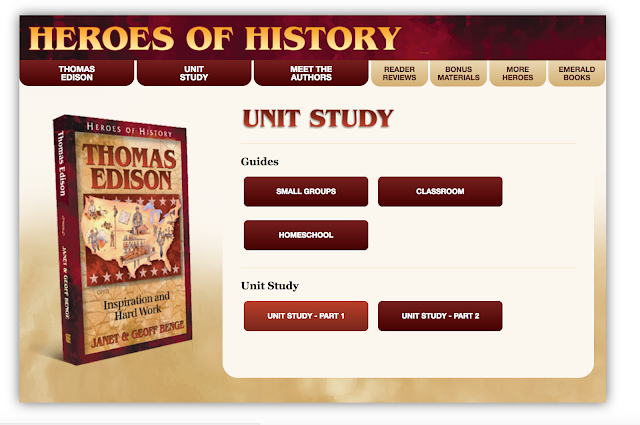 I am always excited to work with these books because the Heroes of History series is one of my favorite history resources. When we've reviewed prior volumes, Luke or Matthew has read the books and worked on the Unit Studies that accompany the biography. Our reviews have always come at a time when we're just about at that point in history, so it's a tiny jump to that person's story. This time, Matthew is studying WWII, and ready to re-visit one of our prior reviews, Douglas MacArthur. That meant Jude got to pick a new book -- and it's pretty exciting when a fourth child gets something new and not a hand-me-down. 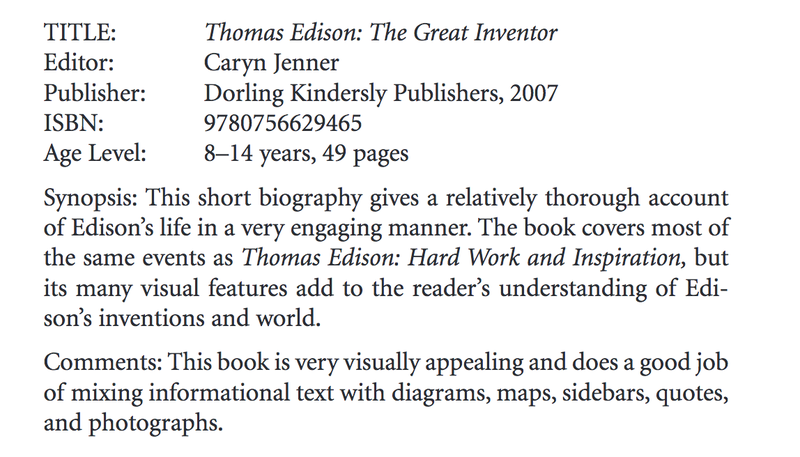 He chose the biography of one of his favorite inventors, Thomas Edison. If you ask people, "Can you name famous people from New Jersey?" their lists would be short. Sure, we have Jon Bon Jovi and Bruce Springsteen in current times, but most people can't name too many historic New Jersey residents. Most do not realize President Grover Cleveland was a native son, or that President Woodrow Wilson was also from our state. General George McClellan, Commander at Antietam, followed his military career with a political one, becoming Governor of New Jersey. However, Thomas Edison tops everyone's list of "Historic New Jersey People." After all, he was nicknamed, "The Wizard of Menlo Park." Between his inventions and being from our state, that makes him one of Jude's favorite people. 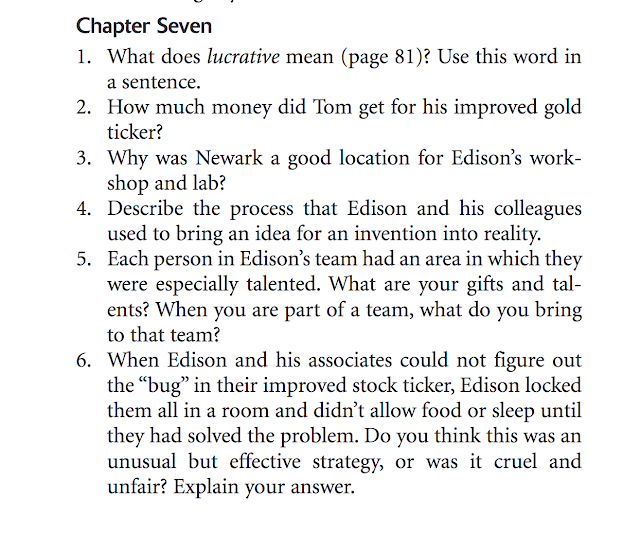 Most biographies focus on Edison's time in New Jersey and his inventions here. Janet and Geoff Benge's story goes all the way back to Edison's childhood in Milan, Ohio, and the very beginnings of his curiosity. A four-year-old Thomas Alva Edison, nicknamed Al, was full of questions. At first, they were wonderings about what life would be like for the people he saw heading west in prairie schooners. His curiosity soon got him in trouble; he nearly drowned in a wheat silo and burned down the town's flour mill. Though he was nearly twenty years younger than his siblings, nobody remembered to tell Al he was only a child, and treated him like an equal. This did not bode well for when 8-year-old Al headed off to school. Jude found he really identified with Edison here. He, too, does not learn in a mainstream way. Like Edison, he only lasted three months in a regular school. Al's bout with scarlet fever left him with impaired hearing; Jude has issues with auditory processing. 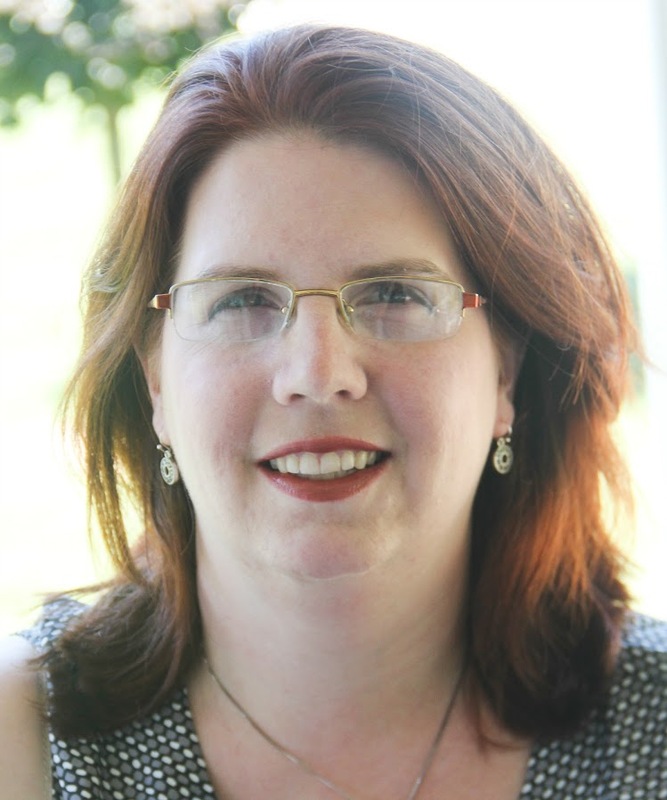 As much as she wanted her son to attend a particular school, Mrs. Edison recognized her son's potential, the damage that school was doing to him, and taught him herself. I don't claim to be raising another Edison, and there were far fewer fireworks when we withdrew Jude, but I feel a kinship to his mama. It's not easy keeping up with a curious mind. The story continues through Edison's adulthood, as he invented and worked in telegraphy, and highlight not only his triumphs and his struggles. 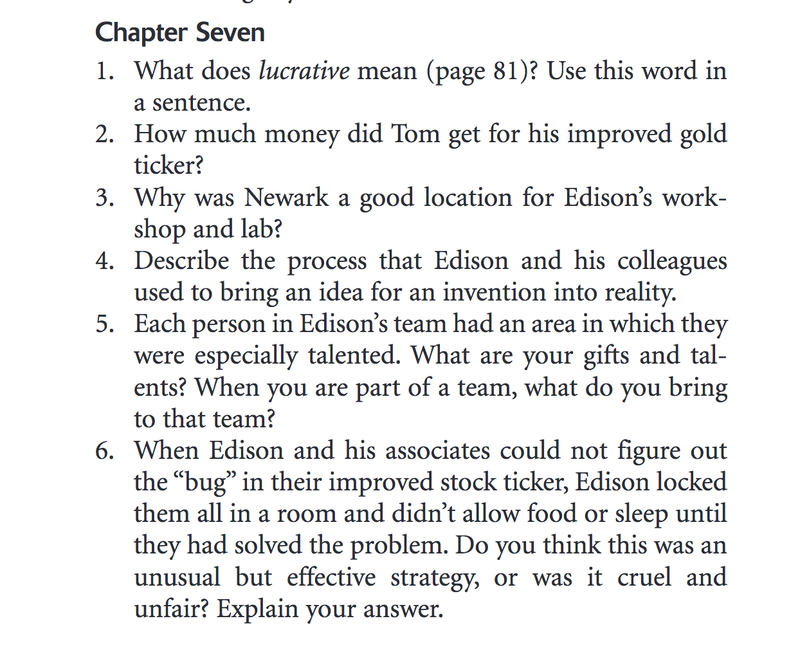 It includes a retelling of when he sold a stock ticker patent to a New York company. For a child of the rural midwest, New York City was overwhelming. He had hoped to sell his patent for five thousand dollars, but would settle for three. The Gold and Stock company offered him forty thousand. That would set him up with a better workshop in nearby Newark to create even more things. Edison didn't allow near-bankruptcy to stop him; he reapplied himself until he was in the black again. Then, he moved to Menlo Park. Jude was particularly interested in this section, because we have been to Edison's workshop in Menlo Park. It was here that Edison perfected the light bulb, lighting the town with incandescent light on December 31, 1879. He developed a way to make Bell's telephone transmit sound better, and then took that knowledge and created the phonograph machine. He determined a way to electrify New York City, and moved his young family there. Unfortunately, just as the now father of three was reaching success there, he found himself a widower. We learned how he reinvented his life again, with a new family and a new research facility in East Orange, New Jersey. Because Jude is only in fifth grade, we didn't do much of the unit study on paper. We're at the point where we are transitioning from "early reader" or "elementary overview" style books to content-driven biographies. I used the concrete questions to check if he was understanding what was written, saving some of the more open-ended discussions for another time. One thing I really like about both the books and study guides is they are adaptable for so many ages. When my high-school level boys used them, they were great for independent learning and writing practice. 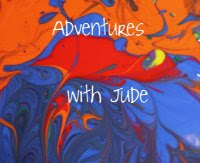 For Jude, formal writing is an emerging skill that we haven't really begun to transition to every class, so I was happy to be able to discuss topics with him to help him work through a dilemma in his head and verbalize his thoughts, without the stress of organizing paragraphs. 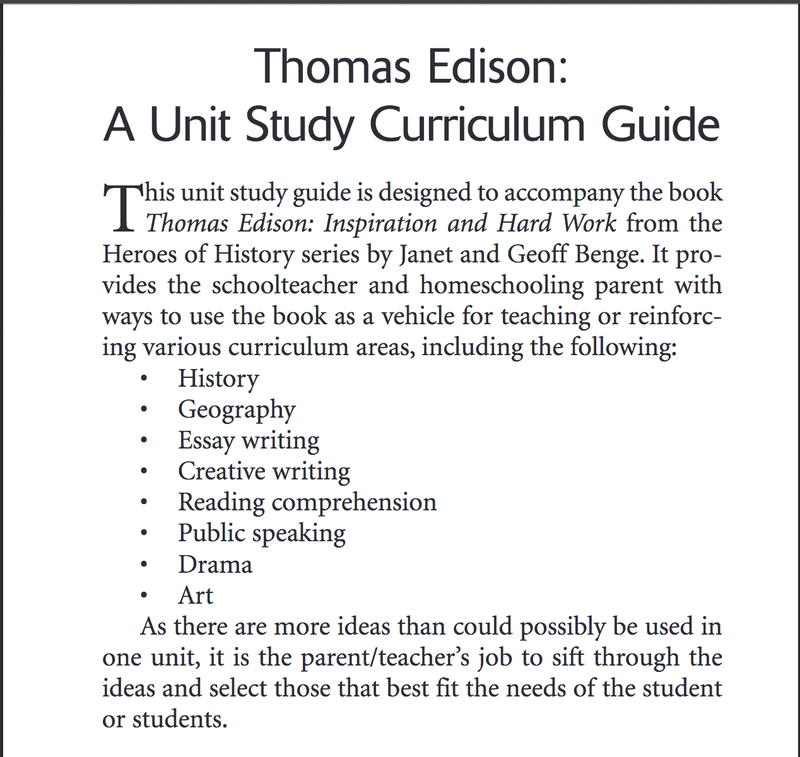 Included with the guide are suggestions for further reading on Edison, including both children's and adult-level books. 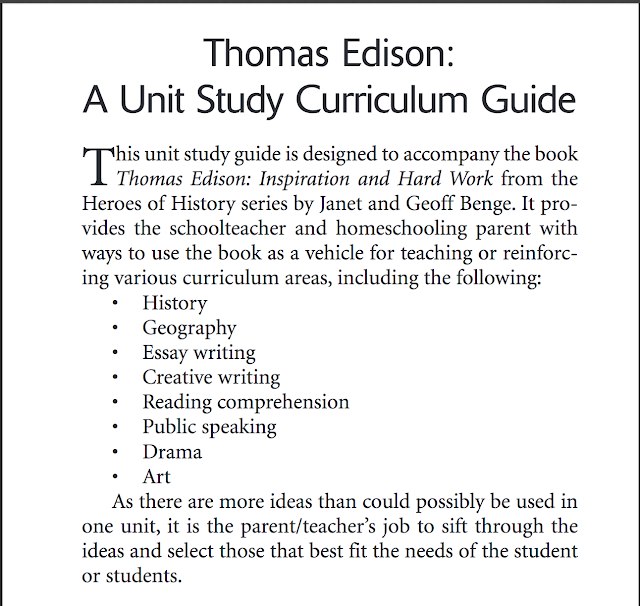 While I will have Jude re-read this book again (likely with a more cursory middle school American History course), long-term planning has me wondering if a third trip through the book when he gets to high school is worthwhile. I can see me keeping the book itself for a long time (he's already made me promise to keep it so he can read it again), but by then it might be good to have a new book to read. Having the list and the notes about individual suggestions helps me choose books that are good quality. In the meantime, there are other books now on his wish list, such as Thomas Edison: The Great Inventor (Ed. Caryn Jenner) because of the description. Once again, YWAM has blessed us with a fantastic book and study. We're very happy to add this to our growing collection. Jude has moved on to reading the other editions we already have, and is making a list of books he wants to read next. If you'd like to read our prior reviews follow the links below. Click the banner below to read this current round of Crew reviews.